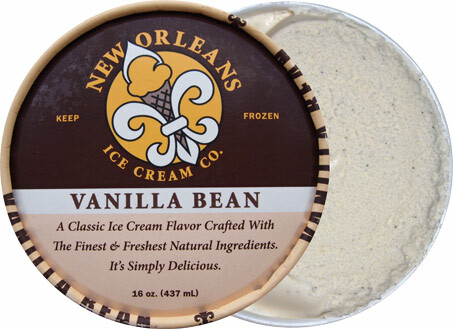 Alright mes amis, it's time to get New Orleans Ice Cream Company back up on the blog. Now they've gone and done me the awesome favor of sending EVERY single flavor that I haven't tried yet, so it seems only fair to go big with their first return post. This is today's trifecta of craziness. See, if there is one thing you need to take away from this post, it's that New Orleans ICC strives to be both adult and fun, much like the city that spawned it. They aren't aiming to get your kids' attention, they want the grown ups in the room to know what the city is all about. I just don't think anyone else really compares to them in that regard, at least not around here. First up is my daughter's request. Every now and then she just wants something simple so she picked Vanilla Bean. Now no matter how unique a company's flavors are, deep down they still need to respect the classics. Love the flecks! Yes, I say that every time, but it's still true. 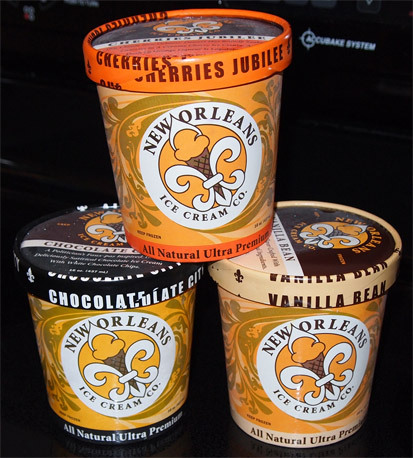 The more the merrier and this pint is rocking a nice strong vanilla flavor. It's a sweet flavor with a really creamy texture. I went back for a second scoop and I'm not sure if I'm picking up the sweetness, a hint of vanilla extract, or maybe a bit of both. Either way, it's definitely delicious. I won't argue that! Next up is my wife's sample. Now you've been around the block a few times with me, so whenever you see Cherries Anything you are probably thinking here comes another Cherry Garcia knock off. No no no. This is the more mature, chip free version with an adult only audience. 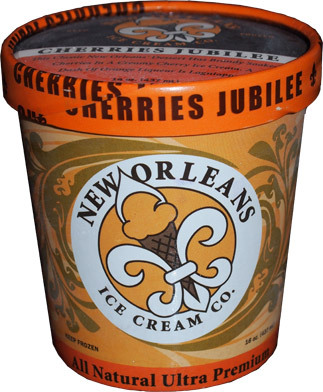 See, it's a cherry ice cream base but they've gone and soaked the cherries in brandy (and "a dash of orange liqueur is Lagniappe" [a gift]). I'll admit it, I didn't like this one at first. I took a few bites when I scooped my wife's serving and the alcohol really throws this one off for me. I manned up and tried it again though and there is a secret to this one. Rather than scooping a big spoonful, take a nice thin scooping slice off the top. You just want a little bit at a time so it doesn't overpower you. See the cherry flavor is real mild, and I'm not even picking up the orange, so that means I need small bites to not be overwhelmed. It may sound simplistic, but it totally got me through the second scooping. Oh, the ingredients of this one make it the least creamy (little icy) of the bunch. Last up is my choice of Chocolate City. Oh sure, it seems so simple. 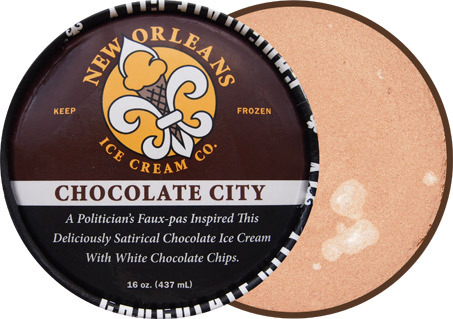 Playing off a certain mayoral quote, this one claims to be a deliciously satirical chocolate ice cream with white chocolate chips. Wait, satirical chocolate? He looks innocent enough doesn't he? Almost nothing going on.... but it's all a rouse. You see, I take a big whiff, but it's not a straight chocolate I smell. The "troubles" start as soon as I try to slice into the pint to get the picture above. These are no mere chips in here. No no, I keep getting stuck on chunk after chunk of hard white chocolate. This is NOT a complaint, quite the opposite really. It's got me curious as to how the chunks will taste. I take my first bite and to my very great surprise I am hit with a dose of coffee flavor! I quickly check the label and sure enough, COFFEE!! 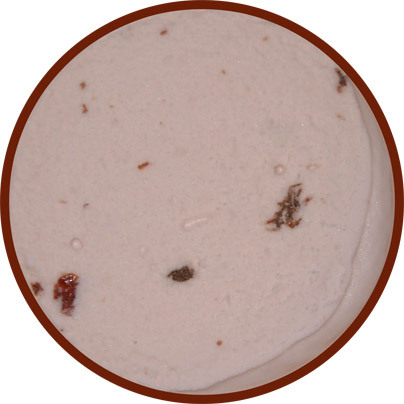 Now it is the last ingredient on the list, so this pint isn't a straight coffee flavor, but being an extract, it's strong enough to be a pure coffee taste. 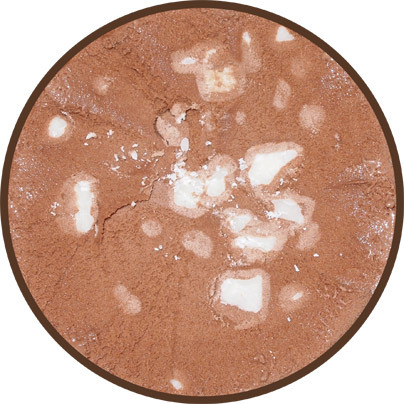 What I mean is that this isn't mocha, instead it's definitely coffee and chocolate, or maybe chocolate and coffee (I was having trouble deciding which comes first). It's one of those things where if you eat it quickly enough you won't notice the coffee much but you can't miss it if you try and savor every bite. Now you know I'm not much of a coffee buff (I practically gagged on the Weight Watchers Latte bar), but this one ain't bad (and from me, that's a big compliment). 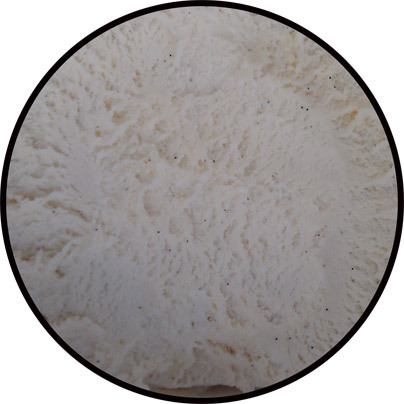 It's a high quality ice cream, and it's got some neat solid chunks, but the coffee overrides everything for me. The white chocolate makes this awesome cracking sound when you chomp it, but I don't actually taste any white chocolate. Let me say it this way. This pint is neat enough that I can enjoy eating it, but the second I stop, all I taste is coffee and that bums me out a little. Oh, if anyone is curious, I turned the last half of the pint into a mean nesquik shake and shared it with my wife... and by share I mean I gave her the top 70% and I ate the bottom 30% that had all the neat white chocolate chunks in it. What can I say? I am what I am. Love the way you fashioned the Sunday edition of OSS! The cherries jubilee sounds amazing!